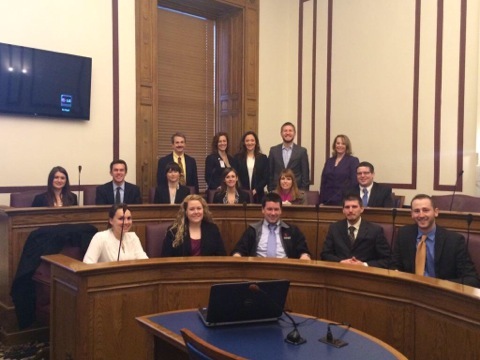 IUEM Residents attended the annual Emergency Medicine Legislative Day at the Indiana Statehouse, organized by Emily Fitz (PGY3 EM Chief Resident and INACEP Resident Representative) and Lindsay Weaver (Emergency Medicine Associate Professor). Throughout the day, several legislators from both the house and senate stopped by to discuss issues in healthcare with the residents. Dr. Tim Brown (Chair of Ways and Means), Dr. Jennifer Walthall (Deputy State Health Commissioner), and Dr. Heidi Dunniway (President of the ISMA) also participated by sharing their thoughts and individual experiences in advocating for patients through healthcare policy. It was enlightening to hear the extent of their dedication and passion for advocacy, and the ways in which a physician can become a leader in their field. B1269–Department of Corrections become POA and assist inmates with Medicaid application not only while in prison and when released to ensure proper medications and support for inmates with mental illness. National shortage of providers- increase funding for loan reimbursement, psych residency spots to increase # of psychiatry providers. Opioid abuse is becoming an epidemic issue affecting our city, state and country. Americans comprise <5% of the world’s population yet we consume ~80% of the world’s opioid supply. 120 people die in the U.S. every day from an opioid drug overdose. Opioid abuse does not discriminate. It affects all socioeconomic classes and ages, and being unemployed/homeless are not good predictors of abuse. Recent increased restrictions on opioid prescribing has had several unintended consequences. This includes a worsening heroin epidemic as well as HIV outbreaks in select communities as a result of increased intravenous drug abuse. Senate Bill 406 (SB406), if passed, would allow physicians to prescribe Naloxone OTC without examining the patient for whom the drug is intended. It would also allow for family/friends/first responders to administer this medication to individuals experiencing an expected opioid-related overdose. We support passage of this bill which, when used in conjunction with current 911 Good Samaritan laws, can help save lives. We have several goals looking towards the future. We request continued support for state-side databases such as INSPECT. We need additional funding for addictions counselors and facilities across the state. We need improved resources and treatment options for individuals with mental health. Our vision is to better identify patients who have a high risk of opioid abuse/addiction/overdose so that they can be treated appropriately either in chronic pain programs, with addiction specialists, or in various opioid clinics around the state. 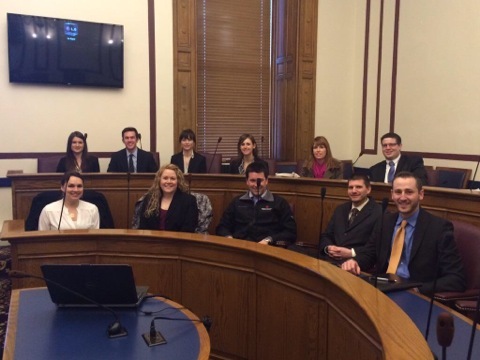 Thank you to Dr. Emily Fitz and Dr. Lindsay Weaver for organizing a successful Legislative Day, and also to everyone for your participation and for representing Emergency Medicine in Indiana!